1939 Alb.1, blue Štefánik, block of four UR, mint never hinged, extraordinary chance for kompletaci miniatures! 1939 Alb.SK31N, Hlinka 2,50 Koruna blue, imperforated pair, trial printing, exp. by Mahr., cat. 5.000Sk, rare!! 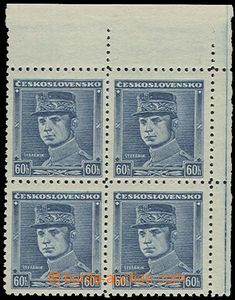 1939 Czechosl. 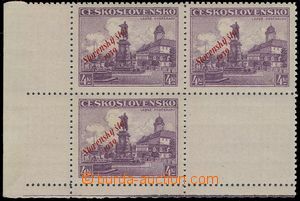 letter-card CZL2, without margins, sent as Reg to Prague, uprated Slovak stamp. Alb.30, 31, CDS BRATISLAVA 2/ 24.11.39, absolutely good condition, extraordinary offer!! 1943 CDV4/31, Picture Tatranská Lomnice, sent by air mail + Ex to Bohemia-Moravia, uprated with stamp Alb.L7, L2 2x, CDS Starý Smokovec/ 28.VI.43, German censorship + CDV11, Tisko 50h brown, sent by air mail to Bohemia-Moravia, uprated with stamp Alb.L1 2x, L2, 49 2x, CDS Starý Smokovec/ 22.VII.43; nice decorative!